Do you ever get frustrated by the way Congress and the President spend your tax dollars? Do you ever read about tax legislation in the news and think, “Geez, even I could do better”? National Public Radio’s Marketplace has developed an online game that will let you do exactly that. 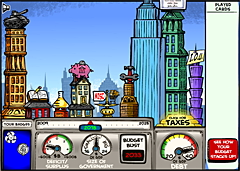 In Budget Hero, you start from the status quo for 2008, when the government is scheduled to go bust in 2033, and the annual interest on our national debt is $248 billion dollars. By selecting various “policy cards” — options drawn from real-life legislative proposals and political debate — you can raise and lower taxes and spending in various sectors. Me, I had no trouble digging us out of the hole. With my policies in place, the U.S. starts logging a budget surplus in 2011, and pays off the entire national debt by 2023. In fact, I did so well I discovered a bug in the program: once the debt interest reaches zero (as mine did in 2023), it starts climbing again for no reason. (I suspect the corresponding equation, instead of holding at zero, tries to go negative — a scenario for which the application is not equipped.) It’s as though the game designers never considered the possibility of a debt-free nation! But even with this minor programming error, Budget Hero is both entertaining and informative. When you’re finished with your budget, you have the option of comparing your scores with other players sorted by age, income, gender, location, and/or political affiliation. I just noticed your links to pocketmint today via Twitter. This is great! I am having fun reading your posts.